As they’ve been in the business for over two decades, it’s no wonder that the guys from Evolution Power Tools have managed to establish a name for themselves. The power tools of this company sport a well-earned reputation – they’re efficient, reliable, and very durable. But can that be said for their new magnetic drill? Bearing the name of EVOMAG28, this model combines the small size with high efficiency and provides the user with necessary accuracy and portability. It also has a pretty reasonable price, especially when we consider the sheer number of features that it offers. For that matter, we got one for ourselves and deeply analyzed all of its characteristics. We went over the unit’s design, power, ease of operation, overall comfort, and warranty, with the mission of finding out its value for the money. If you’re interested in the results, keep reading – here’s everything you need to know about this magnetic drill. The fact that many of today’s buildings are built around a steel framework makes this unit an essential power tool for everyone in the construction business. Sporting a strong magnetic adhesion, an integrated cooling system, and the low weight that makes it very portable, the EVOMAG28 is one of the best magnetic drills in its price category. The unit comes with an industrial-grade build quality – it is durable and won’t easily get damaged. It has a set of big, easy-to-operate controls, via which you can operate its strong 1200W motor that can achieve the maximum speed of 570 RPM. The cuts that it makes are precise and clean, with the max core depth of 2″ and 1/2″ twist drill capacity. With the dimensions of 19″ x 9″ x 13″ and the weight of 38 pounds, the Evolution Power Tools Magnetic Drill is small in size but still highly productive. Its compact dimensions make transportation a breeze, and the same can be said for positioning the drill in confined and awkward spaces. We were quite pleased with the fact that the spoke handles can be placed on both sides of the unit – it’s yet another feature that allows working in tight areas. On the left side of the machine, you’ll find the set of big and easy-to-operate buttons, just beneath the slot for the 3-spoke wheel. The overall construction quality is very impressive, and that’s precisely what we expected from this manufacturer. The model is well-built and lightweight, and it’s perhaps the most well-constructed mag drill in its price category. The 1200W motor of this unit achieves the maximum speed of 570 RPM and is very efficient when it comes to drilling holes in steel. With the magnetic adhesion of 2860lbs/f and the max core depth of 2″, you won’t have problems with any kind of sturdy materials. Even though you can use the unit in any position, it’s important to mention that it works only if the electromagnet has a sufficient hold on the material you’re working on. The unit is supplied with a chuck and a key, offering a pretty impressive 1/2″ twist drill capacity (the twist drill itself is not included in the package). 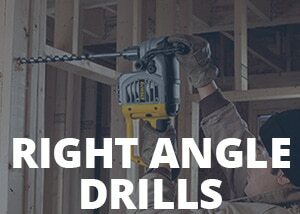 One can use a myriad of different tools with this drill, such as mini-cutters, step drills, and annular cutters. Some of these are included in the package. The Evolution Power Tools Magnetic Drill comes with a 3-year warranty, which is quite sufficient and in accordance with today’s standards. The accessories include a 6-piece cutter kit, some cyclone cutters, as well as the chuck and the key. The look of this magnetic drill is a deceptive one – it’s small in size but still highly efficient. The EVOMAG28 has managed to impress us with its compact design, decent power, as well as with a number of handy features that it comes with. Its 570 RPM motor is guaranteed to meet all of your steel-drilling demands, while its low weight and easy-to-operate controls make handling and transportation a breeze. We were also quite pleased with the unit’s strong magnetic adhesion and its compatibility with loads of different tools and bits. The integrated cooling system also deserves some praise, as it prevents the device from dangerous overheating. The fact that the machine comes with a 3-year warranty inspires confidence about its durability, although its reliability is apparent right from the start – EVOMAG28 is definitely a well-constructed magnetic drill. No matter how efficient this model is, it still can’t be compared with $800+ magnetic drills. Its power is sufficient enough to help you deal with a plethora of steel-drilling tasks, but it’s best to avoid the really heavy-duty jobs. Otherwise, you’re risking mechanical damage and spending additional money for the repairs. Even though the machine is compatible with lots of other tools and bits, the package doesn’t include a Weldon shank adapter for the Jacobs chuck. This isn’t such a big issue, but we still have to mention it as a flaw – the lack of this adapter will undoubtedly leave some users disappointed. The Evolution Power Tools Magnetic Drill has received a positive reaction from those who bought it. Users are very pleased with what they got for the money, saying that EVOMAG28 is flawless in operation and that it serves them well. They’re praising the unit’s construction quality, its strong magnetic adhesion, as well as the fact that it’s easy to operate and move around. They’re calling it an essential part of their workshops, and something that they’re always glad to use. As far as we’re concerned, this mag drill offers an incredible value for the money. Its design and efficiency tell us that the model deserves to be more expensive, so we can do nothing else but praise the manufacturer for putting EVOMAG28 into this price category. The unit is definitely worthy to be considered for purchase – its price/power ratio is just unbeatable.